Fire-Rated steel doors play a vital role in keeping people safe and minimizing property damage during a fire. Labeled fire doors control the spread of fire and smoke for up to 3 hours. Metal fire doors are an economical alternative to wood fire doors, when more than a 20 minute rating is required. Steel is the sole door material to deliver a 3 hour fire-rating. 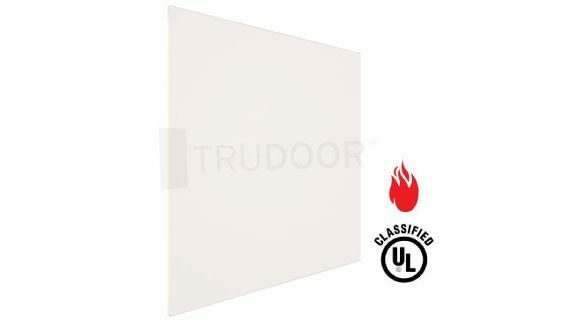 Trudoor is an authorized WHI fire-labeled shop (Warnock Hersey / Intertek), enabling us to modify, re-certify and label fire-rated doors and frames. And, we are certified by UL to cut, re-certify and label fire-rated glazing materials. Our facility undergoes routine inspections to verify that modifications are done in compliance with the requirements of the Intertek and UL specification listings. All material is tested in accordance with NFPA codes and standards. Fire door openings are classified by their locations in a building. Location determines the length of exposure protection required, based on the potential fire hazard of that particular area. The opening classifications are shown below. Fire-protection ratings tested and classified by: Warnock Hersey-WHI or Underwriters Laboratories- UL. The local Authority Having Jurisdiction must be the final authority on fire door assembly issues. Note: Most exterior doors do not require fire rating, unless there is the potential for fire exposure from the outside of the building. See Flush Metal Doors for non-rated doors, which are made from the same construction as a fire-rated metal door. 4 Hour These openings are in wall that separate buildings or divide a single building into designated fire areas. 2 Hour Openings of this type are used in enclosures of vertical communication or egress through buildings. Examples include stairwells and elevator shafts. They also occur in boiler rooms and in exterior walls that have the potential for severe fire exposure from the outside of the building. 1 Hour These door and frame assemblies divide occupancies in a building. 1 Hour For use where there are openings in corridors or room partitions. A door with this rating may also be located in the exterior wall of a building subject to moderate fire exposure from the outside of the building. 1 Hour These openings are in corridors where smoke and draft control is required. Fire-Rated doors are required to be self closing and positive latching. Frame and Hardware must also carry the appropriate fire label. Premium UL tested and labeled clear ceramic glass, with surface applied heavy duty safety film. UL labeled wired glass. An economical alternative to glass ceramic, for 20-90 minute fire-rated doors. Use of glazing tape on both sides of all glass types is recommended to minimize breakage. Vision Lite Kits and Fire-Rated Glass Sold Separately. The wall, door frame, door and hardware must all be fire rated. The door must be self closing and positive latching (push/pull plates cannot be used on a fire rated door) and UL approved hinges must be used.